This charming south-facing villa is situated 1 km from the village of Speracedes, with panoramic views of the hills of Cannes and the Mediterranean Sea in the background. In easy reach of local amenities, an ideal location not only to visit the popular resorts of Nice, Antibes, Cannes, St Tropez and Monaco but also many of the typically French villages not featured in your average guidebook.The villa has two floors; with master bedroom with en suite bathroom with wc, spacious sitting room with dining area, American kitchen and a separate wc on the ground floor, and two more bedrooms and a shower room with wc on the first floor. There is a large terrace with two sliding doors from the sitting room, and a few steps below a newly built private pool 8 x 4m. The pool area is completely fenced in. The panormaic views are breathtaking! Golf & skiing: This is the ideal location for the keen golfer, with several golf courses, such as Grasse Country Club, St. Donat, Royal Mougin and Chateau Tolane, all withing 30 minutes by car. The ski resorta of Valberg and Isola 2000 are only 1 hour respectively 2 hours away. In the kitchen there are also a toaster, a coffe machine and an electrical orange-squeezer. We had a fantastic holiday at the villa. It could not have been better. We would love to come back. The villa was fantastic. It was fitted out with everything we could want and was extremely clean, comfortable and well maintained. The view is incredible and you can see right over to the sea and Cannes. The pool was clean and warm and overlooks the amazing view. The villa is well placed to visit many of the beautiful local hill top villages, our favourite being Cabris where we found our favourite restaurant just a short car journey away. We had two great visits to the near by lake where we hired pedalos with slides on the back. The kids loved it. The villa was so nice it was difficult to drag ourselves away to do some sightseeing. The photos on the website do not do it justice. It is bigger and better in real life! 4 of us stayed in Villa Cespedes for a fortnight. The view from the main living room and the long balcony/terrace is wonderful - 180 degrees with tree studded hills and sight of Cannes and the sea some 20 miles away. Every comfort and gadget in the villa which is a carefully cared for home. The terraced garden and beautiful pool are well maintained. Only negative is the traffic noise from the road running along the bottom of the property. We chose Villa Cespedes to avoid the clamour of the beaches and to replicate the rural feel we had when visiting the Dordogne, it did not disappoint! The views are to die for one way across the valleys to Cannes and the other across the lakes and forrests. Below in the valley all the usual services were provided for and we would not have ventured out had it not been for my wish to visit the coast where I holiday-ed as a child. Cabris offers a perched village with ample restaurants whilst Saint-Cezaire-sur-Siagne offers a cradle of mountains with a picturesque village and sleepy charm. There are plenty of other villages to visit from this location and we intend to return in the future. The facilities were excellent although the wifi internet was not suitable for downloding Itunes films. Plenty of terraces and a pool big enough to cool down in and enjoy the infinity views. A car is essential and the approach quite steep although our family estate had no problems. Watch out for gusting winds in the afternoon as parasols take off!!!! This property is as great as it looks in the photos and the views from the terrace are truly exceptional. It was the perfect setting to quietly celebrate my 30th birthday with family. The villa is built into the hillside, so there are a lot of stairs, but this is clear from the photos so there are no surprises. The property is well laid out with a double room and ensuite along with the living area and main terrace all on the same level. The property was clean and well-presented when we arrived and Lisa, the agent, acting on behalf of the owners was extremely helpful and always responded promptly to emails and questions. This is a great location from which to visit the attractions of the Cote D'Azur including and Cannes, Nice and Grasse are all easily accessible from this location and all are well worth a visit. We'd definitely recommend this property. Good organization. Nice welcome. check out easy. Villa in good condition. all satisfied. we would come back for a family stay. We had a wonderful time in this house. Everything we needed was there: in the kitchen, bathrooms, but also around the pool. The view from the terrace and pool was super! A lot of nice trees and flowers were around the house. We had a few nice trips to St Paul de Vence, Nice en Cannes, but also Cabris in the neighbourhood was a friendly village. We'll definitely recommend this property to our friends. 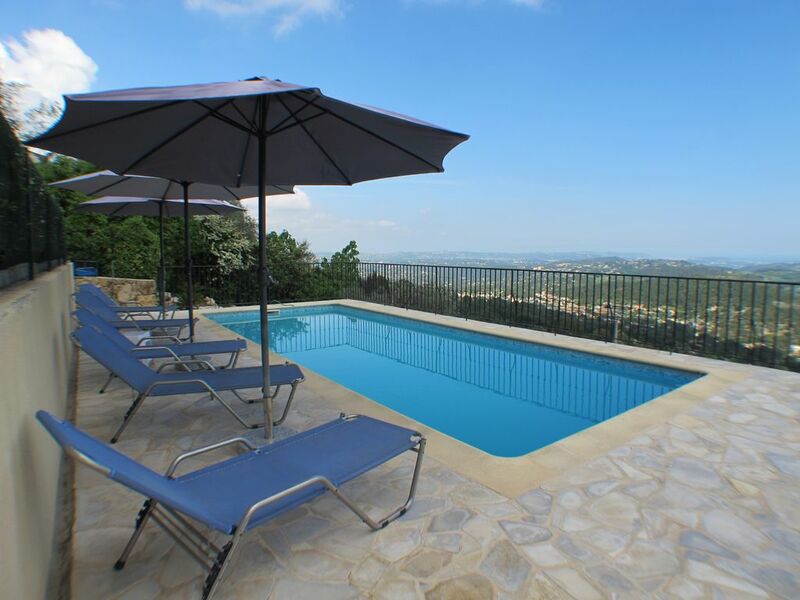 Villa Cespedes is situated 1 km from Speracedes, 5 km from Peymeinade, 10 km west of Grasse. It's only 30 minutes from Nice International Airport.